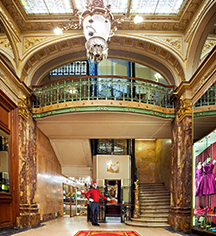 Showcasing Brussels’ rich heritage and offering an inviting glimpse of the city’s glorious past, Hotel Metropole lies in the heart of downtown Brussels -- a city that was once a 10th-century fortress town founded by Charlemagne that has grown at an exhilarating pace while still retaining its historic and cultural heritage. In just a few short hours, guests travel from the medieval splendor of the Grand Place to a vibrant jazz club in a cobblestone alley. 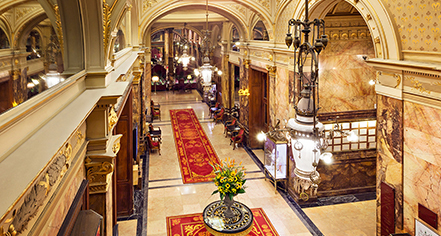 Local knowledge is key, and guests at Hotel Metropole will have the insider's edge. 1200 A.D. is the year that marks the earliest recorded mention of Sainte-Catherine Church. Originally backing onto the city’s ramparts, the work building the actual church did not begin until 1885. A glimpse of historic Grand Place inspires with its quaint side streets, gabled houses, and cobbled square. Narrow, cobbled lanes of Galeries St-Hubert lead travelers to an elegant 19th-century shopping arcade. Constructed by the architect Cluysenaer in 1847, these are the most beautiful covered galleries of Europe. Near an urban park, foreign embassies, and the royal palace, Parc de Bruxelles centers itself in the heart of historic Brussels.